U.S. Secretary of Defense James Mattis and Homeland Security Secretary Kirsten Nielsen, third from the right, visit Base Camp Donna on Wednesday, Nov.14, 2018, in Donna. BASE CAMP DONNA — For nearly 90 minutes on an unusually cool Rio Grande Valley morning, Defense Secretary Jim Mattis, Homeland Security Secretary Kirstjen Nielsen and Customs and Border Protection Commissioner Kevin McAleenan spoke with soldiers and toured Base Camp Donna, the military’s latest large-scale domestic mission intended to support border enforcement. Inside the concertina wire surrounding the base, next to the Donna-Rio Bravo International Bridge, Mattis, Nielsen and McAleenan toured tents and shower houses, and fielded questions from giddy soldiers. “There were a lot of smiling faces,” said Army Maj. Derek Wamsley. Mattis kept the visit between him and the troops, though. He did not meet with the crush of cameras and news media posted outside the concertina wire near the base’s entrance. Neither did Nielsen or McAleenan, or Manuel Padilla Jr., the top Border Patrol agent in South Texas, who joined the tour. There are approximately 1,000 troops stationed at the base, Wamsley said, and approximately 1,300 in the Valley. The mission is to support law enforcement already working here, Wamsley said. 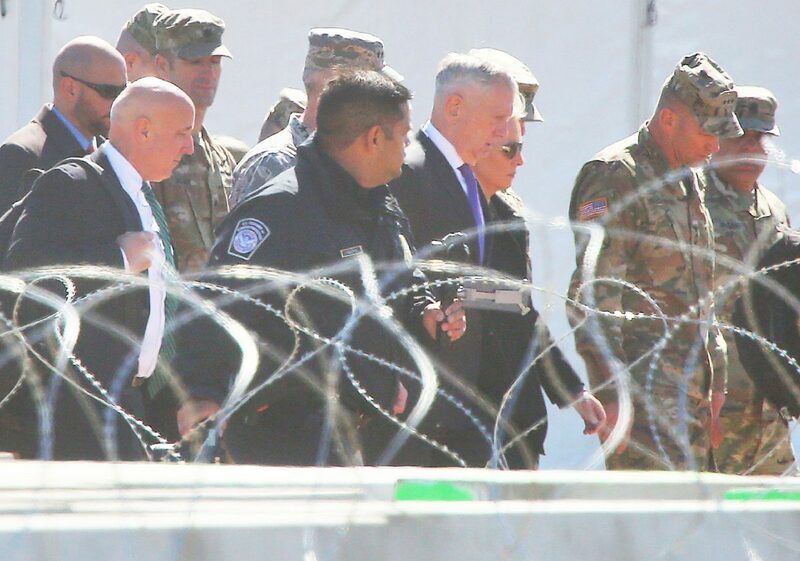 After touring the base, Nielsen, McAleenan and Padilla toured the Hidalgo-Reynosa International Bridge, where troops have also installed concertina wire. Nielsen’s future with the Trump administration does not look bright. Multiple media accounts this week have said President Trump is planning to fire Nielsen. She has been in her job for nearly a year, and has visited the Valley multiple times, including during her first week on the job in December 2017. The Hidalgo bridge, which the group toured Wednesday, is the busiest pedestrian bridge in the county. CBP has made contingency plans that, if necessary, the agency will close the bridge if it’s overwhelmed by the immigrant caravans traveling from Central America through Mexico. However, the caravans are heading to San Diego, not South Texas. On Wednesday, CBP announced it will temporarily deploy 575 officers from Texas to the San Diego area to assist with the caravan’s impending arrival. U.S. Rep. Henry Cuellar, D-Laredo, said on Wednesday that he spoke with McAleenan about the deployment. “During the discussion, I made the Commissioner aware of my concerns regarding the potential impacts to Texas land ports,” Cuellar said in a written statement, adding that McAleenan assured him that his agency will do “everything possible” to minimize the impacts of losing staffing at Texas ports.